Tiger prawn esp. Marsupenaeus japonicus has many names including kuruma prawn and kuramaebi. It is common to be farmed due to its high demand. There are only 15 calories in a single tiger prawn weighing 15 grams. In terms of its 100g calorie amount it is 97 calories, which is one-third the amount of sakura shrimp containing 312 calories per 100 gram serving size. Cooking tiger prawn with shell is said to be more flavorful. However, it is best to its shell along with its intestinal tract before eating. 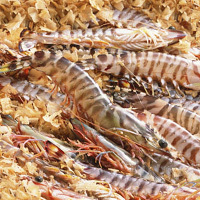 The calories in Tiger Prawn per 15g(1fish small edible part) is 15 calories. Tiger Prawn is calculated to be 97Cal per 100 grams making 80Cal equivalent to 82.47g with 3.24g of mostly protein、0.09g of fat、0g of carbohydrates in 15g while being rich in vitamins and minerals such as Selenium and Vitamin B12.